Saraki’s acquittal by the CCT is quite shocking- Itse Sagay – Royal Times of Nigeria. 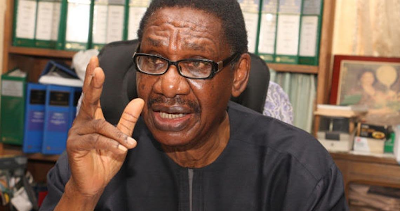 Chairman of the Presidential Advisory Committee Against Corruption (PACAC), Prof. Itse Sagay, has described as shocking the decision of the Code of Conduct Tribunal to discharge and acquit senate present of all 18-false assets declaration charges. Chairman of the tribunal, Danladi Unar, on Wednesday had dismissed the case, stating that the prosecution team had failed to prove sufficient evidence to prove Saraki was indeed guilty. Reacting to the judgement, Sagay said the court was well furnished with evidence. He said; “To start with, I’m shocked, because a lot of materials were put before the court. And for a court to uphold a no-case submission means that there was no prima facie case made. That’s why I’m a bit shocked because I followed the proceedings very closely. But there’s going to be an appeal. We’ll just wait and see happen then, but I’m thoroughly shocked, yes.”.